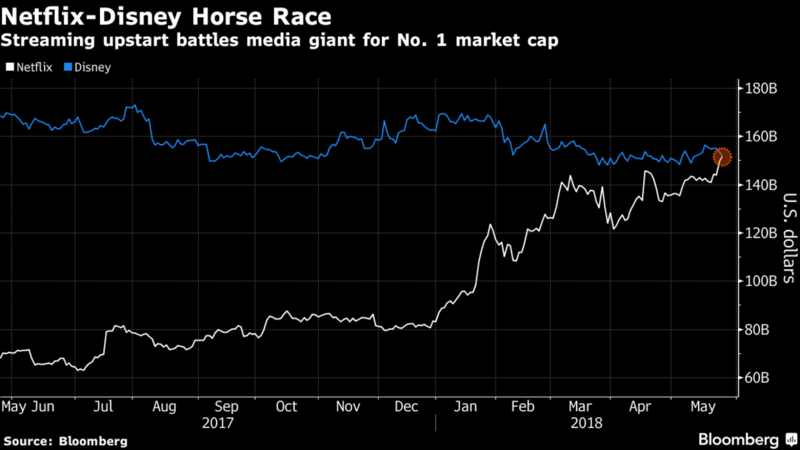 “Netflix’s value has surged from about $20 billion at the end of 2014 and surpassed the world’s most powerful media giants, Comcast Corp. and Disney, this week. Still, Netflix’s revenue remains well below that of the media titans. Comcast is the largest cable provider in the U.S. and parent of NBCUniversal, which owns film studios, pay-TV networks and theme parks. Its sales totaled $84.5 billion last year. Disney, with 2017 revenue of $55.1 billion, owns ABC and ESPN, two of the most valuable TV networks in the U.S., along with its namesake parks and resorts and prosperous movie studio”.